There is something about the dirt. The smell of it, the curiosities of random organisms crawling through it. Young and old alike revel in different ways with it, but enjoy it all the same. I was digging in a side patch of garden, and saw something gray scurry by. It wasn't a mouse, probably a vole, but it instantly sent me in a scream of, "ahhhh!!!! get it! get it!" which instantly made everyone run close, but alas within those .025 seconds, it had run off to locations unknown. Honestly, it was hilarious, exciting and a bit unnerving wondering where it went and how it might affect the future of the garden. However, now the kids are armed with a story of "something gray and furry lurks in this corner" in addition to the stories they make up about the "bunny rabbit that lives under the deck". Upon seeing mommy digging in the dirt, they all grabbed shovels and followed suit. Even the neighbor's nephew came over to get his shoes muddied (much to his mother's dismay). 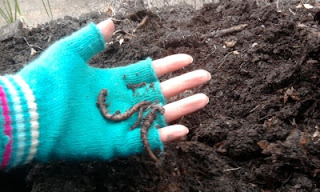 Everytime they upturned another shovelful, I'd hear excited yells of "wormies! WORMIES!!!!" and "ROLY POLY!" sometimes a wonder filled "It's cute." The wee ones were busy digging their own stories. The little 3 yr olds shovelling dirt. 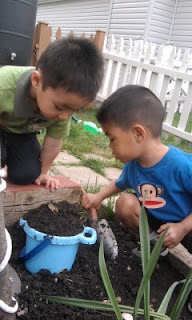 I told them the bucket was full and the contents were not retaining, but they threw caution to the wind and piled on the dirt! Little scamps! When I asked what the peanut shells were for, they replied "food for the worms". Ha...! 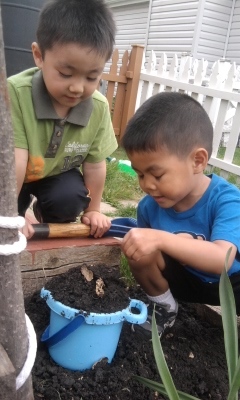 Checking for more worms or roly polies. And here I am on the other side of the house turning in the compost, and leaves with the soil. I guess even at this age, finding big worms is exciting. The only difference is I just smile and keep it to myself... that is unless I find a ginormous one. Then it calls for "AAAAAAA!! Kids!!! GIANT WORMIE!" and the fountain of youth goes on. They didn't eat the worms, did they. LOL no. But ...hrmm three year old boys, you never can be too sure what happens when I turn around.